Don’t miss the opportunity to return to Springfield for MSU Homecoming! If you haven’t had a chance, come help us celebrate our new Pike House on Elm Street. The ZX Alumni Association, Baxter Hall Housing Corporation, and active chapter will be celebrating our many accomplishments. We look forward to seeing you there. 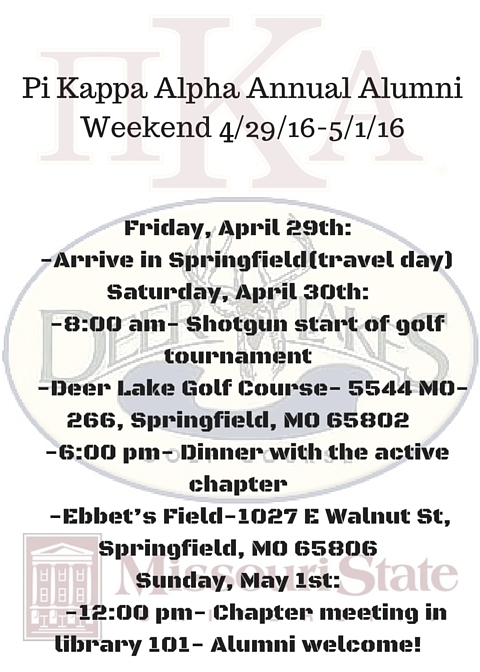 We have a full schedule of events for Pike alumni. This is always a fun weekend. SINCE THE CHARTERING OF ZETA CHI! The 50/150 All-Class Reunion Weekend! 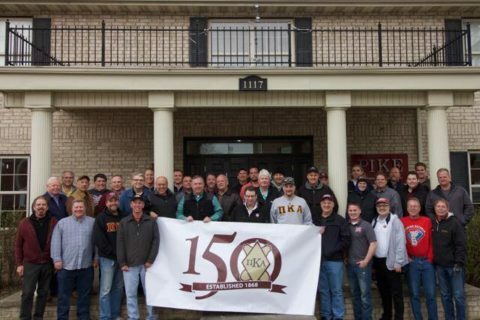 Our chapter is turning 50 this year, and PIKE INTERNATIONAL is headed for 150! The 50/150 event is a dual celebration! REGISTRATION FOR CELEBRATORY DINNER IS REQUESTED BY APRIL 10. ZETA CHI is about to host the biggest fraternal event at Missouri State this year: The Firemans’s Challenge. This competition, based on the highly successful national event, is gaining traction from areas outside the region, hosting firefighters from several states. Visit https://www.zxfiremanschallenge.org for complete details. Join us for dinner at one of Springfield’s tastiest venues! THIS EVENT IS FOR ALL CLASSES of ZX. IF YOU HAVE NEVER BEEN TO ANY ALUMNI EVENTS, THIS WILL BE THE ONE TO EXPERIENCE. HELP CHEER ON OUR ZX ACTIVES AS THEY HOST THE CHALLENGE. THEN, WE CELEBRATE OUR SUCCESS THAT EVENING. URGE YOUR PLEDGE BROTHERS TO ATTEND. WE ARE LOOKING FOR A RECORD REUNION. 3:00 p.m. – 4:00 p.m. Alumni Association Annual Meeting – Pike House, 1117 E. Elm St.
7:00 p.m. 50/150 Year Celebration Dinner at Ocean Zen, known for its tremendous food. HEADCOUNT IS DUE BY APRIL 10. PLEASE REGISTER ASAP! Professional attire; coat and tie preferable for Saturday evening events. For the latest information on the Zeta Chi Alumni Association visit our website or join us on Facebook. Please join us for the Zeta Chi Alumni Association annual meeting and golf tournament on June 24, 2017. We will have a great day of golf at the beautiful Golf Club At Deer Chase in Linn Creek, MO (www.deerchasegolf.com). The event will include a 4-person scramble, box lunch and awards reception with dinner following golf. Hole Sponsorships Available for $50 Donation. Don’t have a foursome? Signup as an individual golfer and we can arrange the teams. Thank you for your support of the Zeta Chi Alumni Association. 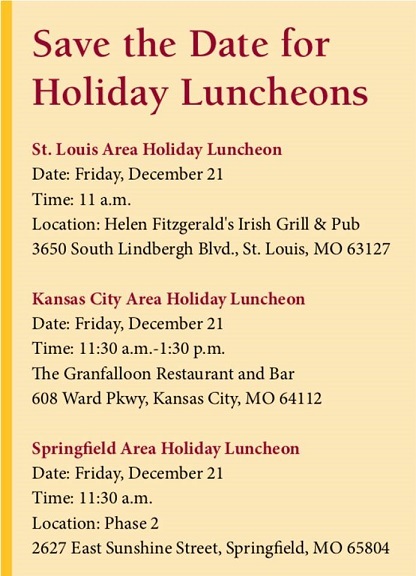 Pike Holiday Luncheons have been planned for both Kansas City and St. Louis. Please see the details below for time and location for both events. This is a fun luncheon and I hope to see you there. I look forward to seeing everyone and Happy Holidays to you and your family. Want to see who’s attending ZX Homecoming 2016? ** If your donation is for the Spence Jackson, Matt Inman, or Steve McFadden rooms, please see additional instructions at the bottom **. Thanks to everyone who made a pledge to ensure the new Zeta Chi Chapter house is furnished. You can make your donations online through the links below. All donations are being tracked so if your donation is linked to a specific room, please make a note on your check. The preferred method of payment is a check so we don’t have to pay the transaction fees. The second preferred payment option is to use the On-line Check ACH option on our on-line donation page. Click on the link below. Or if you want to pay with credit card or PayPal, please use the Pay Now button below. Attention: If your donation is for the Spence Jackson, Matt Inman, or Steve McFadden rooms, please coordinate with Jeff Counts. Send your check made our to “Baxter Hall Properties” to 318 Panhurst Court, Ballwin, MO 63021 and Jeff will coordinate with the Housing Corporation. 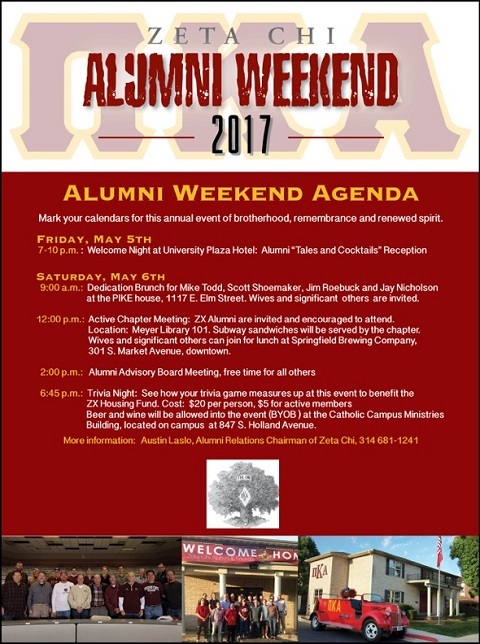 It is still not to late to enjoy the Alumni Weekend hosted by the Active Chapter. The final details are listed above with one addition.